It was a last minute trip that we decided to do in Killarney. 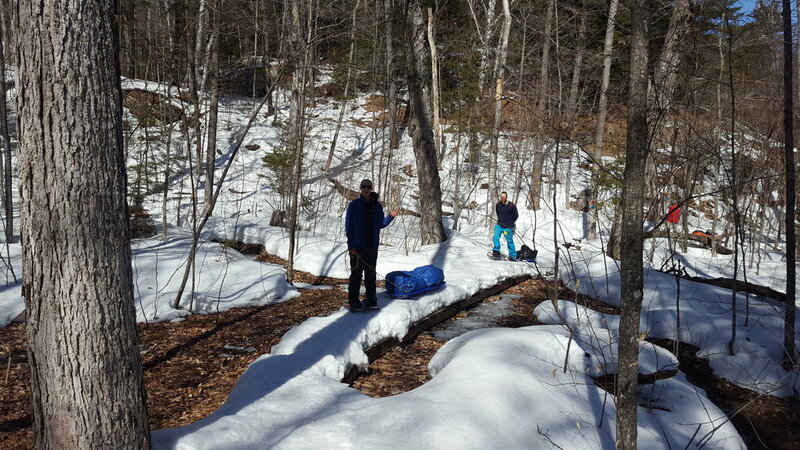 Our initial weekend plans fell through, and we were eager to get out for another winter camping trip. Noah, Andrew and I were going to be towing our blue sleds once again, and our friend Gary was going to be pulling a sled that he had built, that seemed to have a better construction. We woke up at 8am and there was moisture on the insides of all of the windows. I guess squeezing 3 guys into a vehicle would do that. Needless to say none of us got the best sleep that night. Noah sleeping on the sleds, Andrew sleeping in a sitting position, and I had my feet wedged between the front two seats so I could stretch out while sitting in the back. The office opened at 8:30am and I picked up the permits while the rest of the group boiled water for oatmeal and coffee. Noah and I had both recently bought new “Stick Stoves” that we were pretty keen to try out. 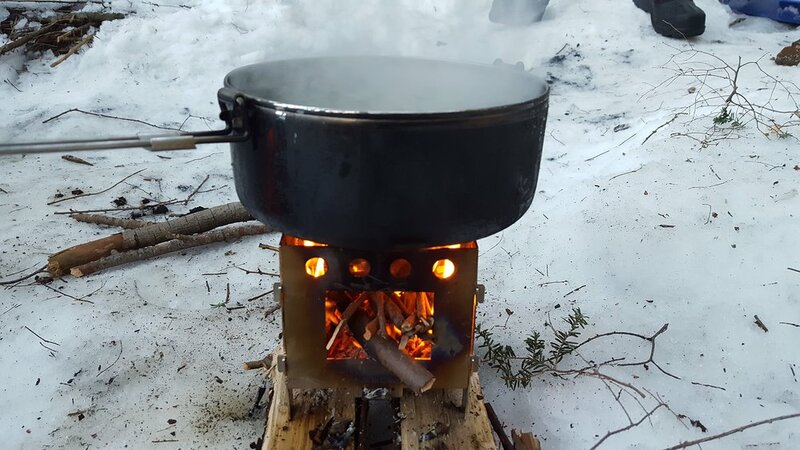 These stoves basically give you a container to build a fire in using sticks so you don’t need to bring fuel with you. Since the planning for the trip was fairly rushed, we managed to make a mistake on the meal prep, bringing only 8 packs of oatmeal for the 4 of us. This had to last two breakfasts! I think Gary was starting to question his decision to leave the meals up to us…luckily between all of the granola bars and jerky, we managed to get a bit of food in us that would hopefully get us to the top. After we finished breakfast we drove the 7km down the road to the parking lot for “The Crack,” which is really not marked well at all. There was only one other car in the parking lot, which is a lot different then when you come in the prime months and people are parked all the way out to the highway. We loaded our sleds and set underway at 10am. We didn’t yet know exactly where we could camp but we knew we would figure it out as we went. The first section of the trail is nothing too crazy. It is relatively flat for the first kilometer or so before it starts to climb up the mountain. Shortly after we passed over Kakakise Lake is where the real incline starts. This is where we decided to leave our sleds thinking that it might be too difficult to get the sleds up the hill. We packed a few beers and some lunch and began our hike. 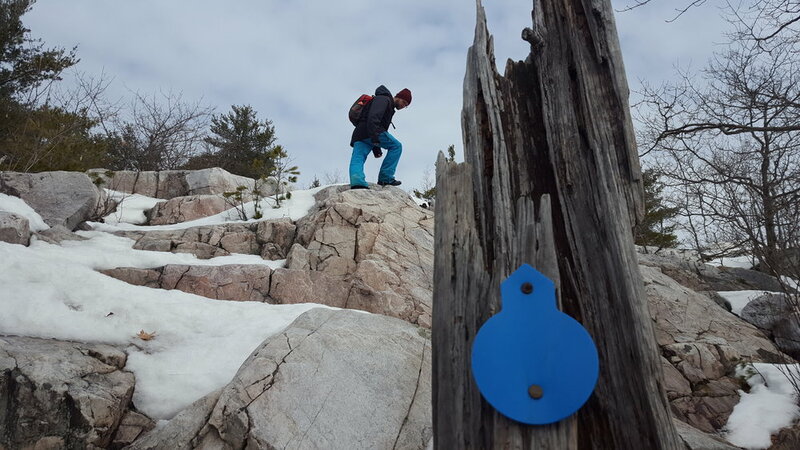 Noah, Andrew and I used our snowshoes for the first section of the climb and it seemed to help in some areas. 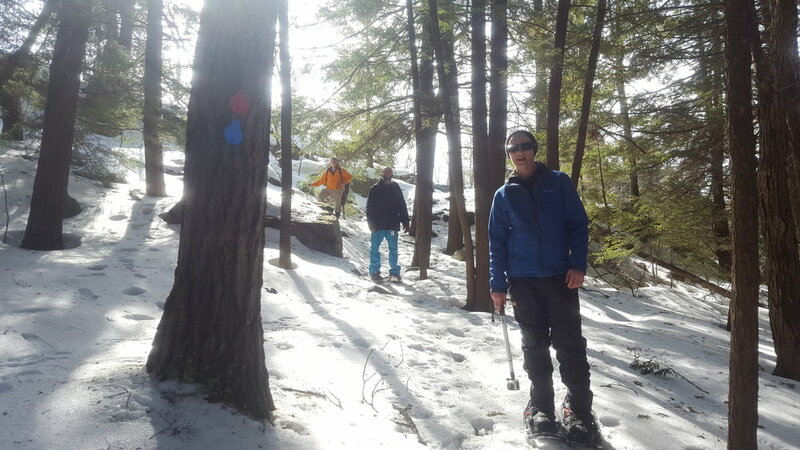 Gary was doing well trekking on with just his pair of boots leaving his snowshoes behind with his sled. The climb to the top of The Crack really does not take too long. It seemed to go by very quickly but I find I am easily distracted on these hikes that have such beautiful views. The view from the top is absolutely stunning. Being in the same spot in the fall, it was nice to be able to see it in a different season. We had lunch and a beer and continued hiking past the top section of The Crack. Gary was familiar with 3 other smaller lakes that he was interested in checking out. The hike continued for another kilometer or so before we arrived at the first of the small lakes, Little Superior Lake. 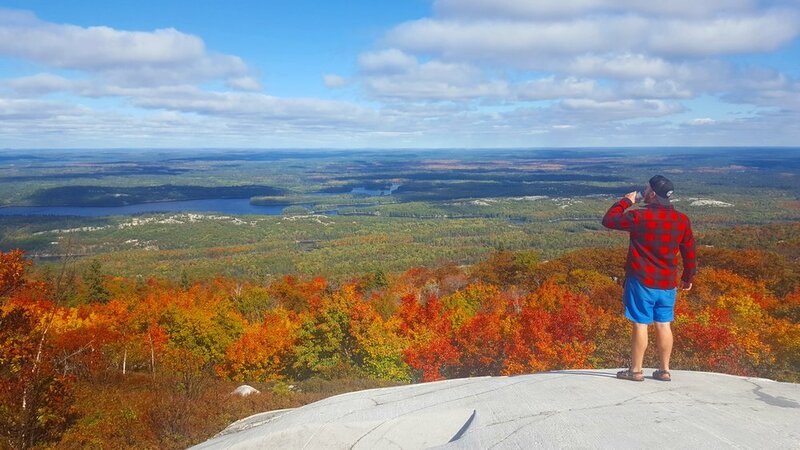 The hike along the ridge offers many scenic views over the lakes that are below. It is worth the hike back if you have the time to do so. At this point it was around 3pm, and knowing that Noah, Andrew and I had to set up a tarp to sleep under, as well as gather wood for the night, we opted to make this our turn around point. Gary continued on to check out the other lakes, which he assured us we missed out on. For those who are familiar with the trail, the very first of the incline sections is one of the most difficult sections of the hike. It is steep, you need to watch your footing, and there are not many flat sections to give you a break. This section takes you up and into the forest that is on the same level as Kidney Lake. We had made Gary a deal that if we were to carry his sled up for him, he would accept the new location to set up camp at the top of the first steep section. The spot at the bottom where we had left our sleds did not offer much privacy from the trail or much protection from the wind. Also we were really keen to set up in the forest by Kidney Lake. Dragging 4 sleds up a steep incline is no easy matter. Breaks were taken frequently but it still didn’t save the sleds any damage. Once we got our first 3 up, Noah and I climbed back down to grab Gary’s sled, which we chose to carry on our shoulders to keep it in one piece. The next few hours were spent doing what we like best, setting up our tarps and sleeping bags, as well as processing all the wood we would need for the night. Dinner that night consisted of Chilli and Sausages. It was nice to have a solid meal after a hard days work. We watched the sun set over Kidney Lake with The Crack in the background. We had seen another gentleman who was climbing to the top of The Crack to camp for the night to get some photos. We could see his headlamp as he walked around the rocks up top that night. Sharing some drinks and good stories around the fire before we settled in for the night. Gary had brought some southern comfort with him to share and we think it will be a staple on our trips going forward. This was Andrew’s first experience sleeping under a tarp and he was pretty excited to give it a go. Once again we made a fire close to our heads as a nice way to fall asleep. The morning had arrived quickly for me. I think as soon as my head hit the pillow I passed out instantly. Andrew didn’t get as good of a sleep since he had injured his knee the day before and it kept him up that night. The sun was shining and it was warm out! We loaded up our typical breakfast routine with coffee and oatmeal before tearing down our camp. The hike back to the car could have been done in a t-shirt it was so warm out. We made great time leaving our site at 11:30am and getting to the parking lot at 1:00pm. We were camped at Kidney Lake so we didn’t have the full hike to do. I think in the future we will need to backpack it, so that we can make it to the top to camp. It would be a cool experience to camp at the top of the mountain but maybe we will save that for Silver Peak next winter. That is one of the benefits of camping in the winter. Being able to camp anywhere really opens up some great options. Another successful camping trip all around, and I think Gary might even consider joining us again! Difficulty - Difficult - The first section of the hike is flat for a good 1.5-2kms but the final 1-1.5kms is a steep climb up to the peak. Towards the very end there are large boulders that require good physical condition in order to get to the top. Proper footwear is required. I needed to do a post specifically on hiking the two famous trails in Killarney, Silver Peak and The Crack. 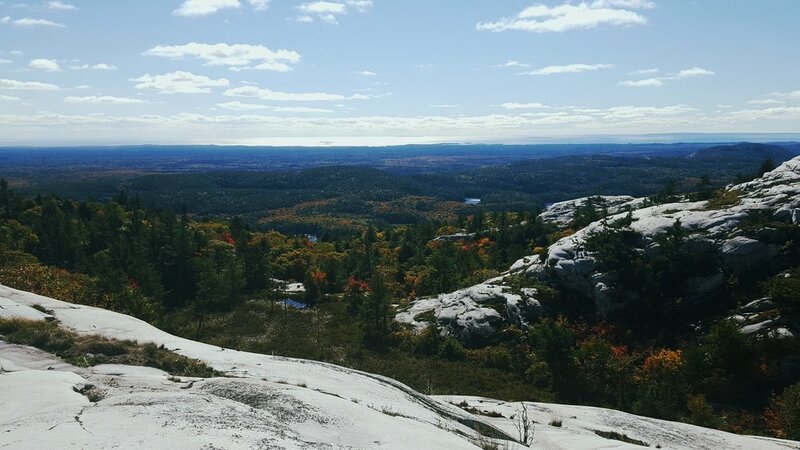 I have wanted to do these hikes while on previous trips in Killarney, but unfortunately have not been able to find the time. Usually this was because we were on a tight schedule to make it to our next campsite. This time I was heading to Killarney to spend Thanksgiving weekend in a yurt on George Lake (luxury for what I am used to) and I had no excuses. It was the perfect time to get these two hikes in and I am definitely glad we did..
Saturday we set out early in the morning to do The Crack. We drove our car 7kms to the parking lot where we would start the hike. The beginning of this trail is very deceiving as it is very flat for the first 2kms, aside from the odd section with a small hill. But then the fun really starts! The final km of this hike is straight up the mountain, and there are parts that even the more experienced hiker would struggle with. 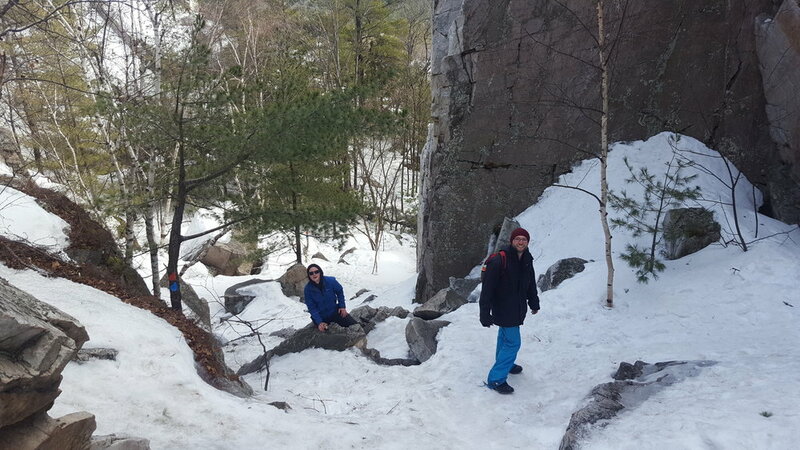 You start by climbing the beautiful rock that Killarney is known so well for until you make it to the final section before hiking through the crack. 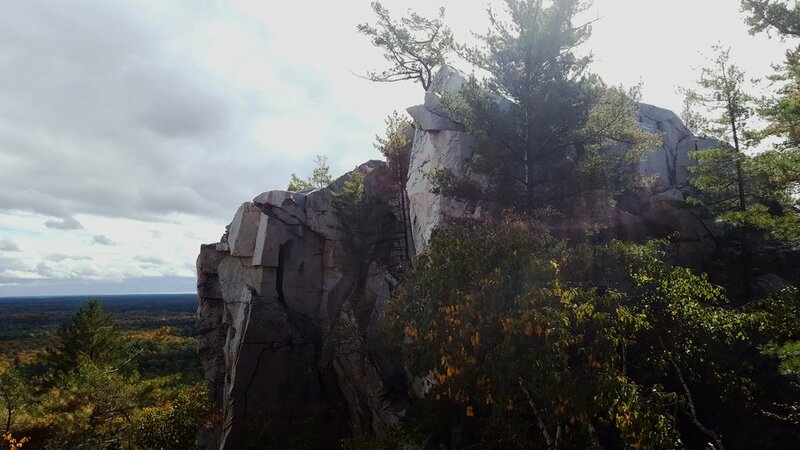 This final section is littered with large boulders that require strategic path selection to minimize the effort required to pull yourself up to the next level. This continues for a solid 200m. We saw groups who had brought larger dogs out and they were really struggling to make the climb. 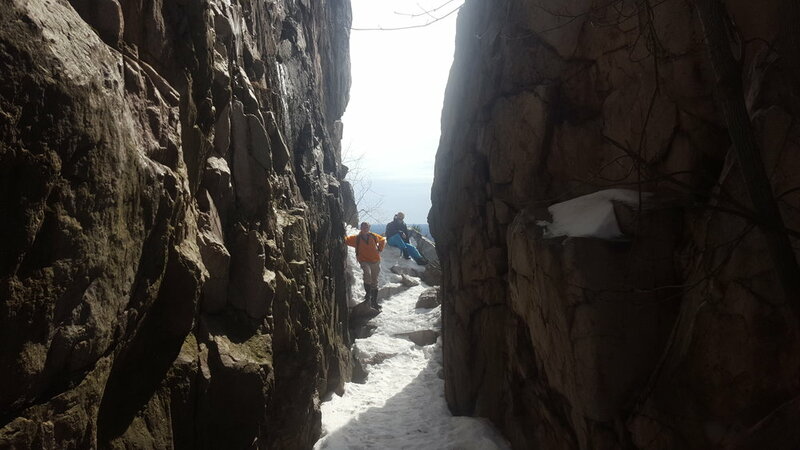 Then you get to the Crack which features a large crevasse where the trail continues between two very tall rock walls (such a cool spot to hike through!). Shortly after the crack is where you come up to the spot you had been waiting for. This is the part worth every step you took on the way to the top, and will not disappoint. 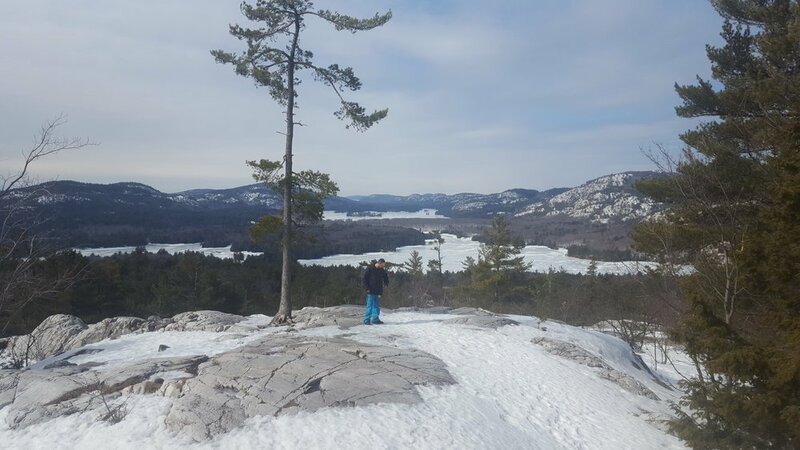 As seen in the photo above (and others below), you look out over Killarney and O.S.A Lake which is lined by the beautiful La Cloche mountain range. 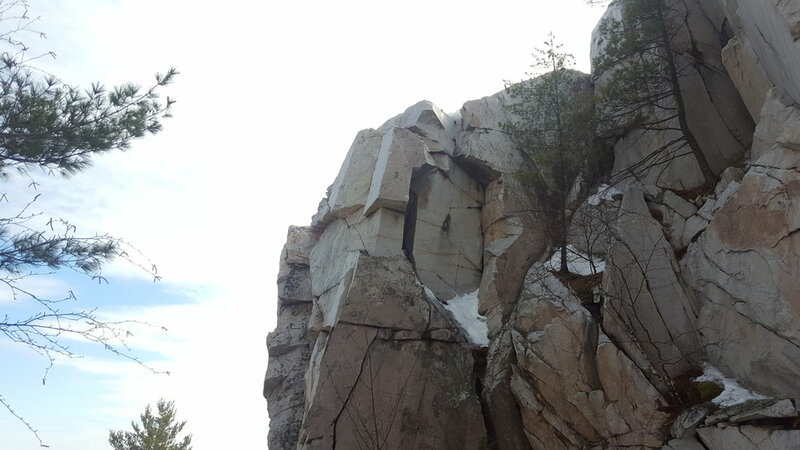 The top also has a spectacular bird's-eye view of The Crack which you walk through just before reaching the peak. Walking to the other side of the viewing area you have a great view over a vast forest which with the fall colours made it that much better. This is a bit of a difficult hike but one well worth doing. Sunday morning was a cold one, and this morning we were going to be paddling Bell Lake to get to the start of the Silver Peak trail. The paddle is about 3km and takes about 45 minutes to get to the start. Bell Lake was really choppy Sunday morning which added a bit of time to our paddle but we made it without getting too wet or cold. The Silver Peak trail starts off very easy and flat, and was a really nice trail to hike in the fall with all the leaves. It continues this way for a little over 2kms. At this point there is a sharp left turn that instantly starts to climb up the side of the mountain. With little to no flat sections beyond this point you quickly gain elevation with every step you take. Within 30 minutes of starting the climb, we were already being teased with beautiful views through the trees of what was down below. 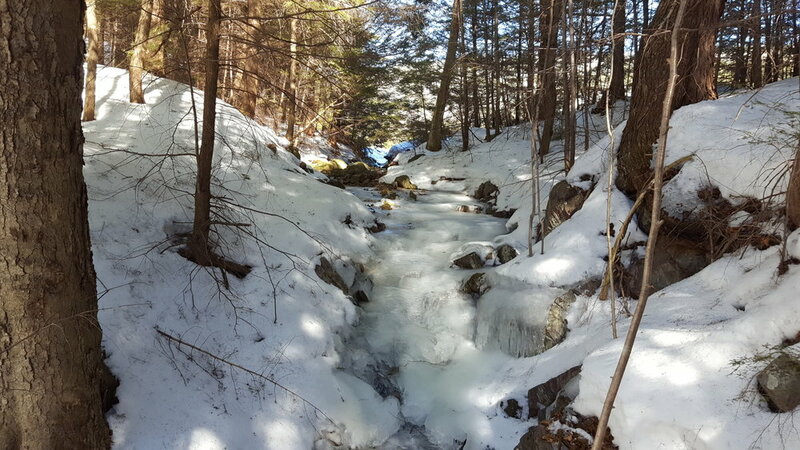 The trail actually runs near a creek for a while and as a result creates numerous slippery sections you must be careful walking on. As you continue up the mountain there is a waterfall on the right side of the path which was a nice spot to take a break. Just when you think you are getting close to the peak, the trail takes a turn away from the edge and deeper into the forest to climb the mountain even higher. 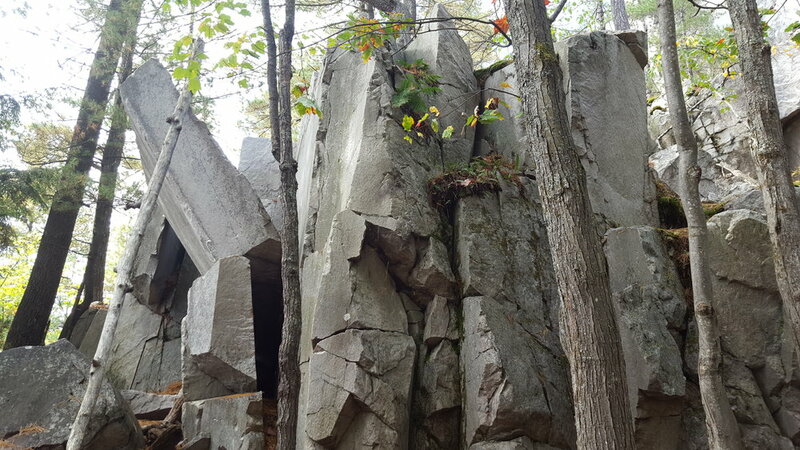 Finally you see a lot of large rock sections that you are required to navigate until you reach the very top. Arriving at the top you are instantly rewarded with a full 360 degree view of everything around you. 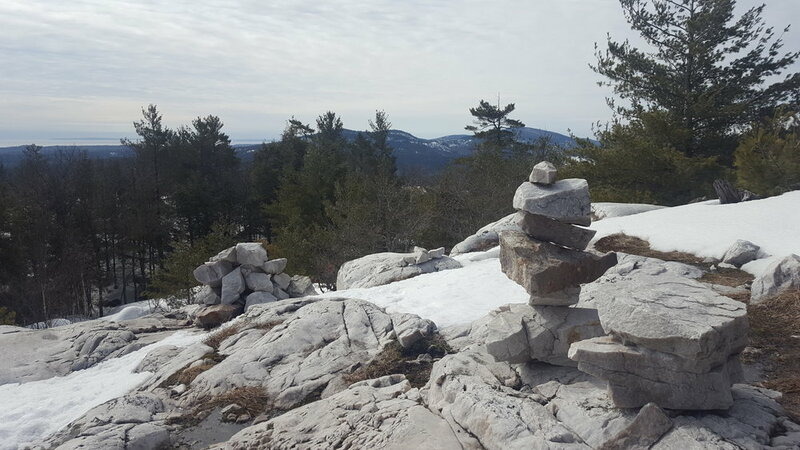 Silver Peak is truly the highest point in Killarney and an excellent vantage point. One direction overlooks Boundary Lake, David Lake and Lake Panache with a very faint sight of the smoke stacks in Sudbury just visible in the distance. This will not ruin your view by any means as you can barely see the city. The other direction has a spectacular view that ends with Georgian Bay in the horizon. There are endless mountains in every direction you look. 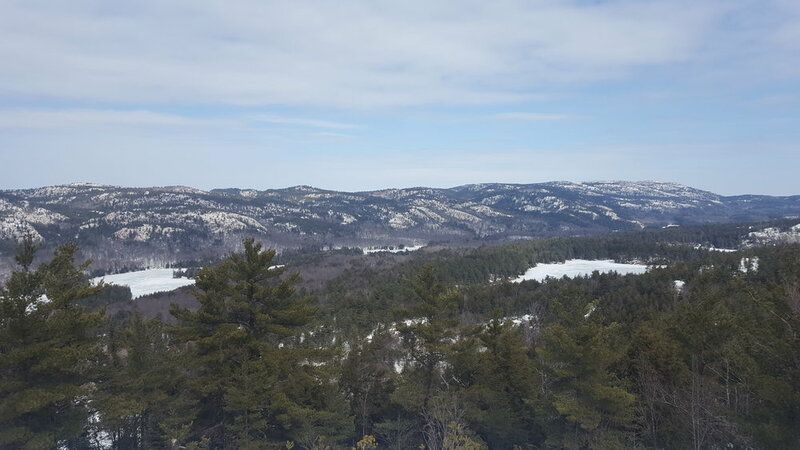 It is the perfect point to see lakes you may have done canoe trips on (we could see Harry Lake which we had done a trip on in the past), as well as the famous La Cloche mountain range. Although The Crack was a spectacular view, Silver Peak blew us away (not just because it was windy up top). 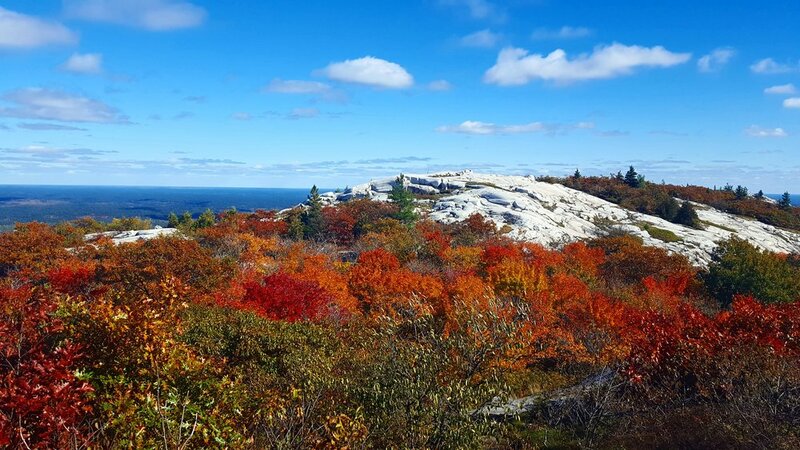 Both of these hikes are worth adding to your list if you have not done them yet. I was amazed by the view at the top of both. 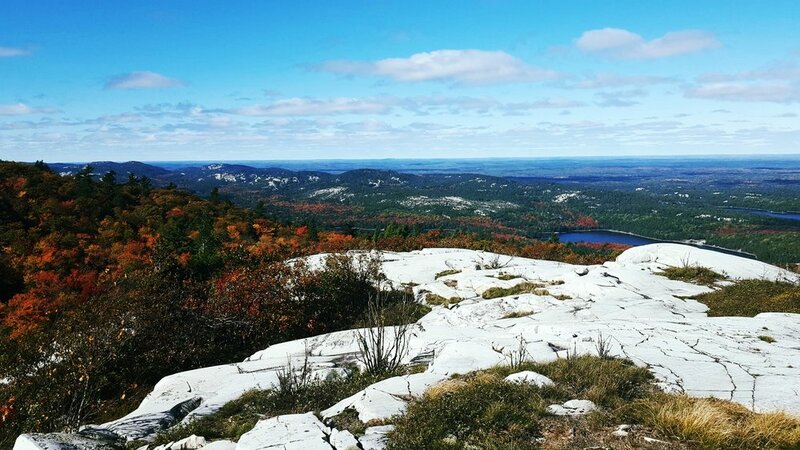 While in some ways I feel that The Crack had a nicer view of the lakes with the La Cloche mountain range, Silver Peak just seemed to have so much more to look at. We could have spent the entire day up there! Silver Peak requires more of a time commitment because not only is the trail longer but you also need to paddle to get there, and I would think that the average person might spend more time at the top of Silver Peak because each direction has something different to look at.